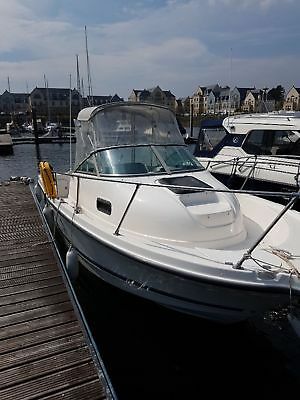 Bayliner Trophy Boat model 2052 year 1999 comes with Trailer , Boat in excellent condition, Boat fitted with a 3.0L mercruiser engine very economical , spare Honda get you home engine, Sat nav ,fish finder ,VHF, Trailer has had two new braked axles fitted, Boat available sometime end of May currently getting underneath cleaned and antifouling ready for boating,Some more information I had not put on about my boat, the new engine was fitted in 2008, the fish finder is a hummingbird 300 TX, the sat Nav is a standard horizon that comes with 2 sat cards, one for the Irish sea and 1 for the Scottish coast (firth of Clyde) Both these cards are £150 each and were purchased only a couple of years ago. The boat has a Sony mp3 wma acc compact disc player that is only 4 years old and comes with kenwood speakers.Currently just dropped off the spare engine BK5 Honda engine at a Honda dealers for a service that’s costing £250. Never had to use the spare engine to get me home only started up 3 to 4 times a year to check it worked.